Welcome to Fun2Go Entertainment…”America’s choice for Great Times” For the past two decades Fun2Go has been the industry leader in mobile entertainment. 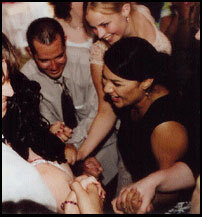 We have entertained for every type of party in every type of venue. Whether your event is a small backyard family gathering or a major corporate event at the L.A. 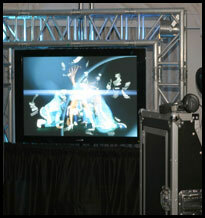 Coliseum, we have the equipment and the professional staff to accommodate your needs. The cornerstone of our company was built on being America’s first mobile VJ Company. You ask what is a “VJ”? A VJ is basically a DJ, but instead of just hearing the music being played, you can see it on large projection screens or plasma screens. Instead of just walking into a ballroom or venue and seeing a guy in the corner with a DJ rig, your guests will light up the room with smiles after arriving and seeing their favorite performers singing and dancing like they had a front row seat at a concert. We have the largest collection of music videos (35,000) available for your next event. If you are throwing a theme party, there is no better way to make an impact than with full motion video decorating your party room. We have videos for all ages and all genres. Take a look above for an example of the music that could be played at your next party. So trust the company that America’s top companies trust, such as Pepsico, Budweiser, American Express, Disneyland, LA Dodgers, Universal Studios, Tribeca, Warner Bros, Capitol Records, Fox Television, MGM, ABC, Modern Bride, and many, many, more.